Pictured built in Oak with FC-7992 Stain. If you are looking for a unique platform bed with storage, just choose the wood type and finish that suits your tastes. This beautiful Amish platform bed features storage space and comes in a variety of wood types. A handcrafted wooden bed will add a feeling of warmth in any home. 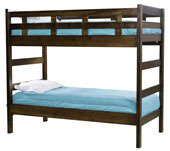 The solid wood bunk bed with a ladder is pictured oak with FC 30529 Dark Antique Slate stain. This kid's bunk bed with a desk and chair is pictured here in oak with FC 30529 finish. Pictured oak with FC 30529 finish. Pictured brown maple with Tavern finish. For a classic, rustic bed, look no further! This 4-Panel Bed is a beautiful, Shaker-style bed that will become the focal point of any bedroom. With clean lines and simple angles, this bed will never go out of style or clash with your existing furniture.That means this bed will last as for generations! Our 4-panel rustic bed for sale has optional slide-out drawers in its base. See below or contact us for more details! The Adrianna bed is an elegant piece that will significantly enhance the decor of your bedroom. Headboard and footboard gracefully-curved and four knobbed posts are the main features of this unit. The head and footboard enjoy decorative paneling. Bearing traditional style features, this bed is a gorgeous addition to a romantic bedroom. Each curve of the Adrianna Bed is Amish handcrafted so this heirloom bed will last as long as the home it makes. Replace the high footboard with a low footboard that matches the side rail style and dimensions. Also add an optional six drawer storage rail for space efficient storage. In the quintessential Mission-style, this solid wood, Amish Mission style bed frame is clean, simple and timeless. Mission-style furniture is recognizable for its clean, parallel lines and elegant geometric shapes. The American Mission slat bed has slide-out drawers in its base if requested. Complement this bed and complete your bedroom set with the Mission-style dressers and nightstands available with Amish Furniture Factory. For a classic, bucolic bed, look no further! The American Panel Bed is a beautiful, Shaker-style panel bed that has clean lines and simple angles. See below or contact us for more details. Complement this wood panel bed frame and complete your bedroom set with the Shaker-style dressers and nightstands available with Amish Furniture Factory. Pictured built in Rustic Hickory with Golden Harvest Stain. Corner Post with Capsop right) to select your order preferences. Americana bedroom furniture pictured in oak with OSC-226 Coffee stain. This wooden platform for beds comes with the Bowhill headboard. Other headboard styles are available and need to be ordered by phone. With such a range of beautiful options, it can be hard to pick just one bed. But this bed's design is just different enough to stand out. You can request to have drawers built into the base of this bed and you can also choose what stain will be applied to the natural, beautiful wood. Pictured built in Rustic Cherry with Michaels Cherry Stain. Pictured in Michael's Cherry finish. Pictured in elm with 809 stain. Headboard - 57" Footboard - 33"
Turn into a storage platform bed by choosing headboard only option and add Platform bed. - Floor to mattress bottom: 23"
- Drawer box front to back: 18"
- Floor to mattress bottom: 15"
Headboard - 55" Footboard - 40"